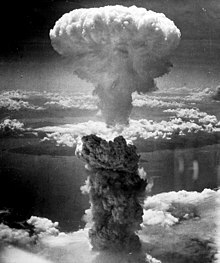 The atomic bomb dropped on Nagasaki haed a plutonium charge. The actinide /ˈæktᵻnaɪd/ or actinoid /ˈæktᵻnɔɪd/ (IUPAC nomenclatur) series encompasses the 15 metallic chemical elements wi atomic nummers frae 89 tae 103, actinium through lawrencium. ↑ Theodore Gray (2009). The Elements: A Visual Exploration of Every Known Atom in the Universe. New York: Black Dog & Leventhal Publishers. p. 240. ISBN 978-1-57912-814-2. ↑ Althou "actinoid" (rather than "actinide") means "actinium-lik" an tharefore should exclude actinium, that element is uisually includit in the series. ↑ Neil G. Connelly; et al. (2005). "Elements". Nomenclature of Inorganic Chemistry. London: Royal Society of Chemistry. p. 52. ISBN 0-85404-438-8. This page wis last eeditit on 13 Dizember 2015, at 01:03.